Hypnosis Denver Can Acupuncture Help You Quit Smoking? Here is a study that I found interesting. I get a lot of questions if acupuncture really works to help someone to quit smoking? I thought I would share this with you because I was a acupuncturist for eight years before I became a hypnotherapist. Hypnosis Denver – Smoking cessation with ear acupuncture. Descriptive study on patients after a smoking cessation treatment with ear acupuncture. Ausfeld-Hafter B, Marti F, Hoffmann S.
In complementary medicine literature studies on long-term observation of one of its methods are rare. The present study is an evaluation of the smoking behavior of patients treated with ear acupuncture for smoking cessation. Additionally we investigated factors that favor or impede smoking cessation. 249 patients who had undergone ear acupuncture for smoking cessation between 1985 and 1998 in a practice in Aarau (Switzerland) were asked before the first treatment to fill in a form regarding their smoking behavior and retrospectively in autumn 1998 a questionnaire regarding the success of therapy. 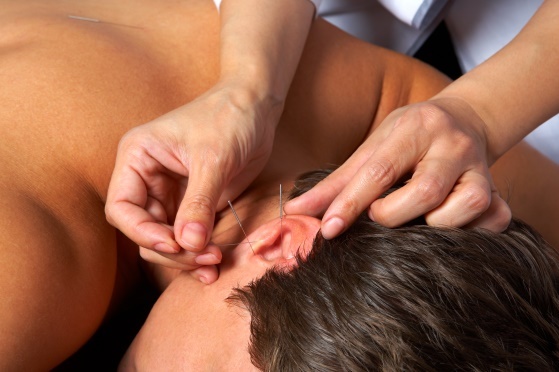 Ear acupuncture treatment consisted of 2 consultations at an interval of 10 days. The responder rate was 53.8% (134 questionnaires were returned). Finally the data of 126 persons could be evaluated. The Kaplan Meier analysis of the abstinence time yielded a one-year success rate of 41.1%. Men gave up smoking more easily than women. Start of smoking as well as start of treatment between the age of 20 and 40 years were favorable conditions for smoking cessation. People who had smoked 20 cigarettes or more per day before treatment profited the best. For people who smoked as a way of passing the time or because of tediousness it was easier to stop smoking than for people smoking because of nervousness. People living in a non-smoker household were able to stop smoking significantly easier than persons living in a smoker household. With a one-year success rate of 41.1% ear acupuncture is a competitive alternative to orthodox medicine withdrawal methods. Acupuncture treatment can be applied and adapted individually, furthermore it is economical and without side effects.